This is the second day of the LD/Ops SIG meet. 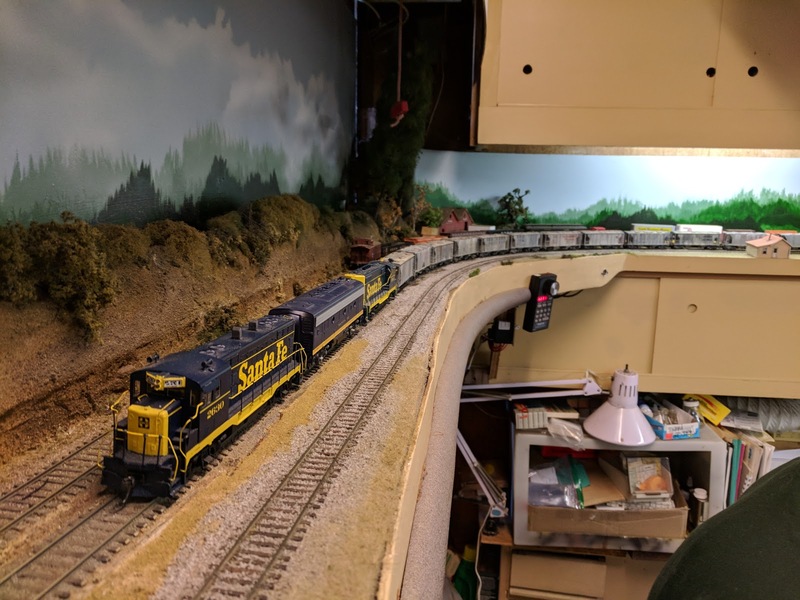 I got to operate at Jim Providenza's Santa Cruz Northern layout, one of the early operating layouts in the San Francisco Bay Area. The SCN operates using Time Table and Train Order (TT&TO) rules. Hey look what is that chair doing under the helix? 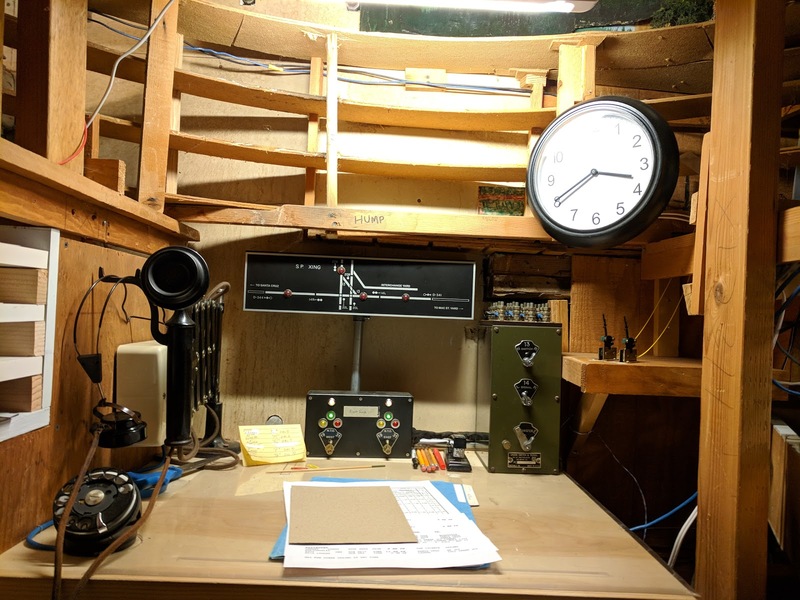 That's one of the station operator positions. Desk, fast clock, telephone system, paper work, as well as the interlocking and train order signal control switches are ready to get to work. This is actually a quite comfortable work space. I was the conductor on Extra 2630, the "Cementipede". This sounded like a neat job in the description. It comes with the drawback that it's an extra, and thus is at the bottom of the pecking order in TT&TO. As it happened there were multiple higher priority trains on the schedule, and we spent a long time in the hole at Holy City. When it was finally our turn, we took off, and in our excitement I promptly forgot that our orders gave us authority only to Fallon, which is the last town before the San Vicente branch line... So while we were happily switching cement cars on the branch line and into Sergeants on the main line, I was asked on which authority we were making these moves. ... We should have coordinated with the operator in Fallon before proceeding beyond that station. 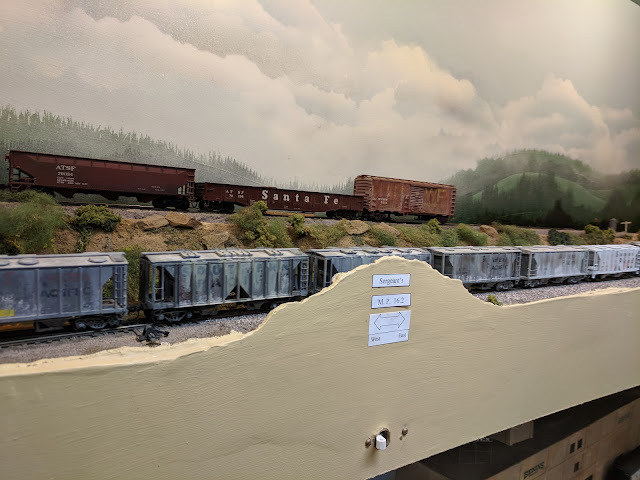 That kind of mistake gets you fired on the real railroad. Here I was reminded how this is supposed to work, and left with the comment "Keep going, I'll get you an order." Thank you! That string of 36 cement hoppers moving on the branch looked cool, though. 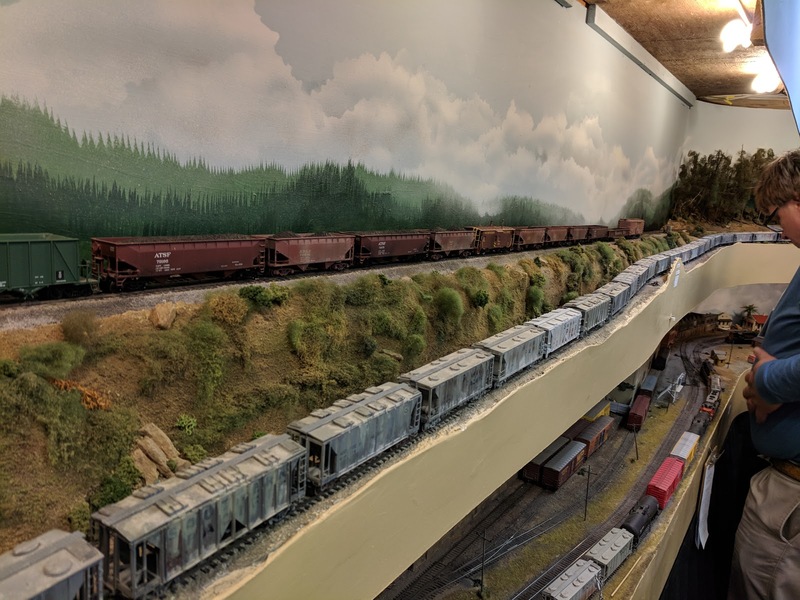 One neat scenery element is this cut through a "slope" on the aisle side of the track. 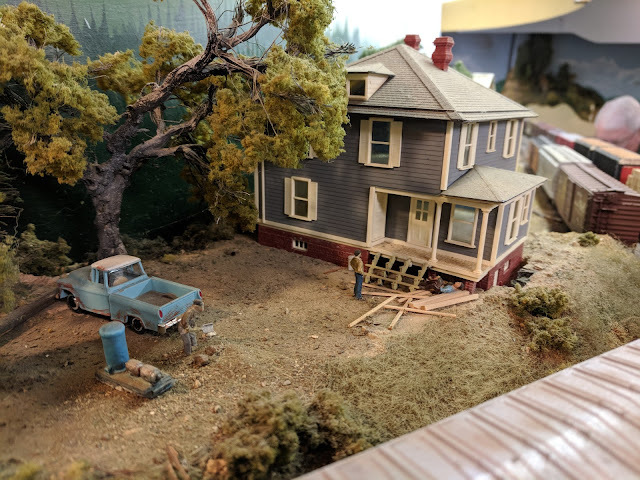 The slight hiding of cars contributes a little bit to the illusion of distance, and makes the scenery more interesting. 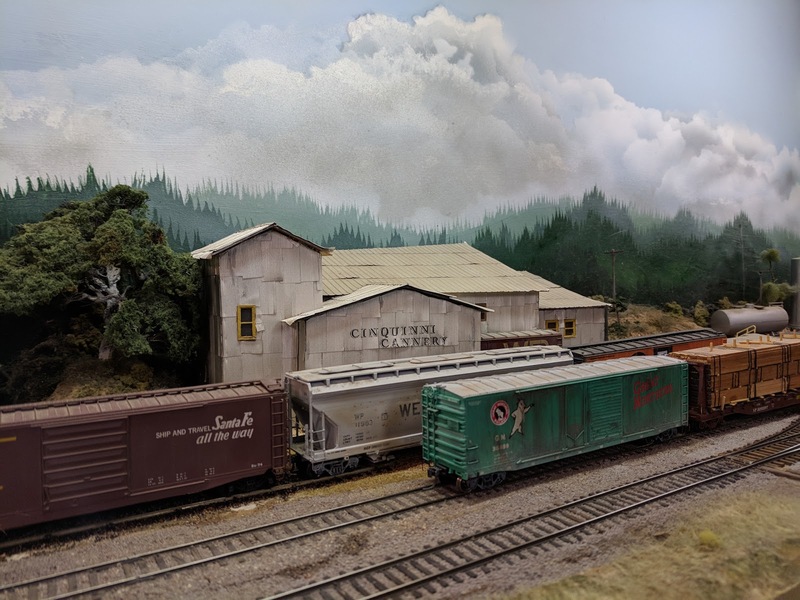 Also note the very nice background scenery and clouds. 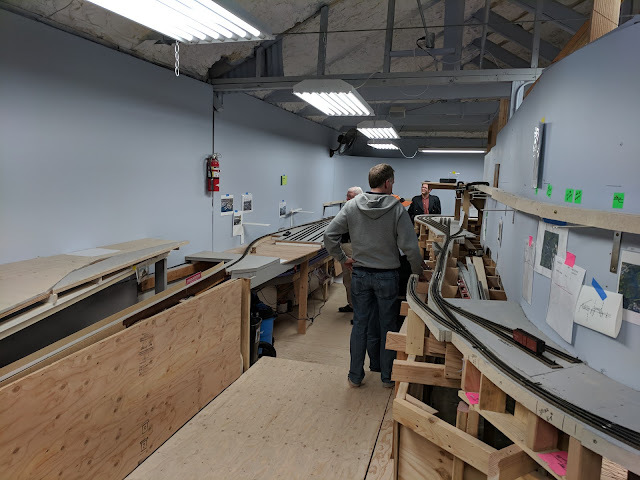 After the Ops session at Jim's, we headed over to the under-construction layout of Paul Weiss. This layout was the subject of last year's layout design challenge and has come a long way in construction over the course of that year. A very large space, an impressive vision, and interesting construction techniques. This will be a real treat when it's ready for operations in another year or so. 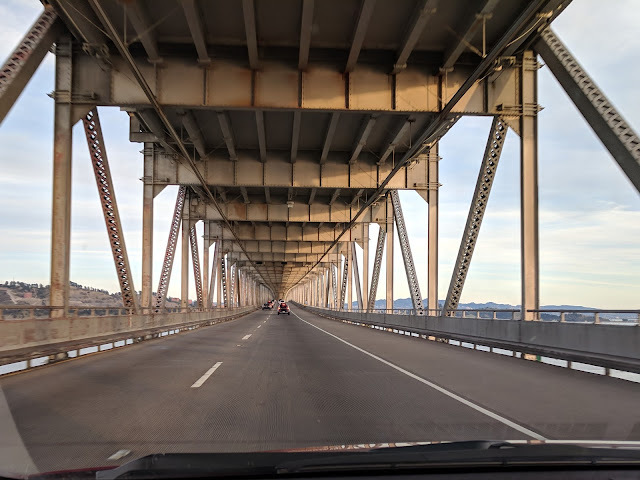 For the trip home I chose the Richmond-San Rafael Bridge, which is always fun due to the roller coaster style roadway. 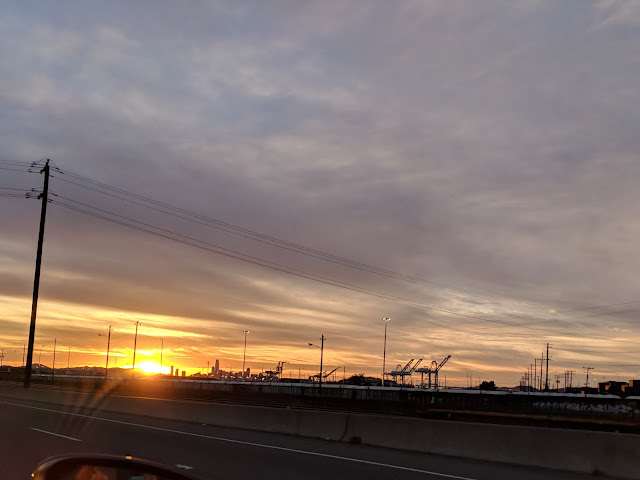 Thanks to slow traffic I was able to capture the setting sun beyond the cranes of Oakland Harbor. 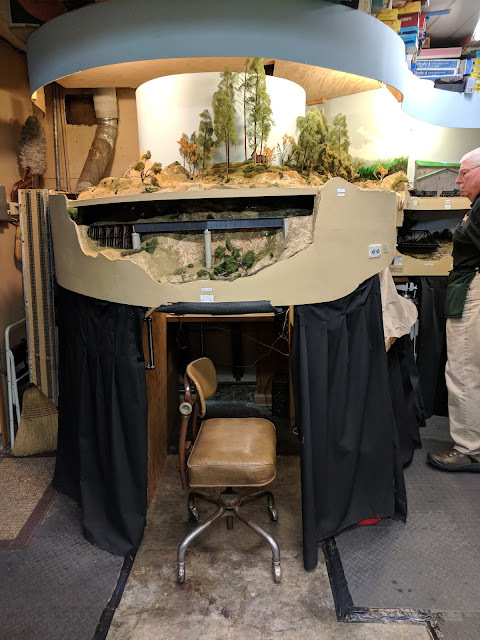 Once again this was a great weekend with friendly chats, interesting presentations, a very entertaining operations session with a great host, and lots of inspiration. The LD/Ops SIG event continues to be one of my favorites on the calendar.